Instant downloads of all 946 LitChart PDFs (including Moneyball). Welcome to the LitCharts study guide on Michael Lewis's Moneyball. Created by the original team behind SparkNotes, LitCharts are the world's best literature guides. A concise biography of Michael Lewis plus historical and literary context for Moneyball. A quick-reference summary: Moneyball on a single page. In-depth summary and analysis of every Chapter of Moneyball. Visual theme-tracking, too. Explanations, analysis, and visualizations of Moneyball's themes. Moneyball's important quotes, sortable by theme, character, or Chapter. Description, analysis, and timelines for Moneyball's characters. Explanations of Moneyball's symbols, and tracking of where they appear. An interactive data visualization of Moneyball's plot and themes. Michael Lewis studied art history at Princeton, and later worked for an art dealer. In 1985, he received an M.A. in economics from the London School of Economics, and afterwards worked for an investment firm. In the late 1980s, Lewis became a financial journalist. In 1989, he published his first book, Liar’s Poker, about the history of mortgage-backed bonds. Since the 90s, Lewis has written articles for a variety of different publications, including the New York Times Magazine, Vanity Fair, and Slate. His other books include The Blind Side (2006), The Big Short (2010), Flash Boys (2014), and, most recently, The Undoing Project (2016), all of which explore a little-understood sector of statistics or economics. Lewis lives in Berkeley, California with his wife and three children. 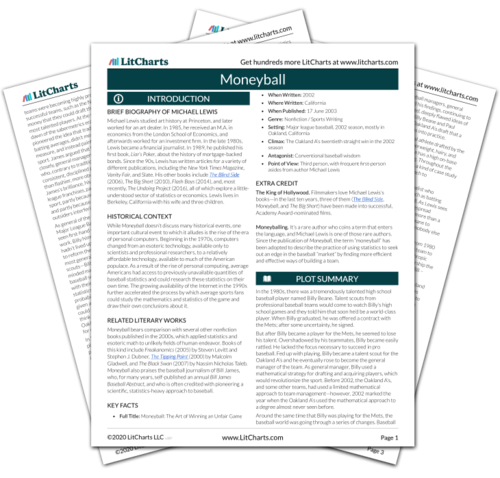 Get the entire Moneyball LitChart as a printable PDF. While Moneyball doesn’t discuss many historical events, one important cultural event to which it alludes is the rise of the era of personal computers. Beginning in the 1970s, computers changed from an esoteric technology, available only to scientists and professional researchers, to a relatively affordable technology, available to much of the American populace. As a result of the rise of personal computing, average Americans had access to previously unavailable quantities of baseball statistics and could research these statistics on their own time. The growing availability of the Internet in the 1990s further accelerated the process by which average sports fans could study the mathematics and statistics of the game and draw their own conclusions about it. Moneyball bears comparison with several other nonfiction books published in the 2000s, which applied statistics and esoteric math to unlikely fields of human endeavor. Books of this kind include Freakanomics (2005) by Steven Levitt and Stephen J. Dubner, The Tipping Point (2000) by Malcolm Gladwell, and The Black Swan (2007) by Nassim Nicholas Taleb. Moneyball also praises the baseball journalism of Bill James, who, for many years, self-published an annual Bill James Baseball Abstract, and who is often credited with pioneering a scientific, statistics-heavy approach to baseball. The King of Hollywood. Filmmakers love Michael Lewis’s books—in the last ten years, three of them (The Blind Side, Moneyball, and The Big Short) have been made into successful, Academy Award-nominated films. Moneyballing. It’s a rare author who coins a term that enters the language, and Michael Lewis is one of those rare authors. Since the publication of Moneyball, the term “moneyball” has been adopted to describe the practice of using statistics to seek out an edge in the baseball “market” by finding more efficient and effective ways of building a team. Arn, Jackson. "Moneyball." LitCharts. LitCharts LLC, 28 Mar 2017. Web. 24 Apr 2019. Arn, Jackson. "Moneyball." LitCharts LLC, March 28, 2017. Retrieved April 24, 2019. https://www.litcharts.com/lit/moneyball.